Today’s guide walks you through the best wood pellets for smoking, to help you match the right kind of wood with the right kind of food. Pellets offer a fantastic alternative to traditional gas or charcoal fuels. They burn cleaner and are much more efficient at imparting customized flavors on your food. However different pellets are good for different types of smoking, so it’s important to know what to get for the right type of conditions. Some burn longer, some burn hotter, and some offer different kinds of flavor. Depending on what meat you’re smoking, what you need from your pellets will differ. You can have the best smoker that money can buy, but if you’re not using the right kind of wood pellets then you risk ruining your food. You don’t want to invest in a big batch of pellets only to find out that it’s not compatible with your grill, or just isn’t good quality. My guide to the best wood pellets for smoking is on hand to tell you what you need for when. I’ll show you my top 5 choices, before walking you through the key things that you should look out for when buying pellets. Let’s get into it. 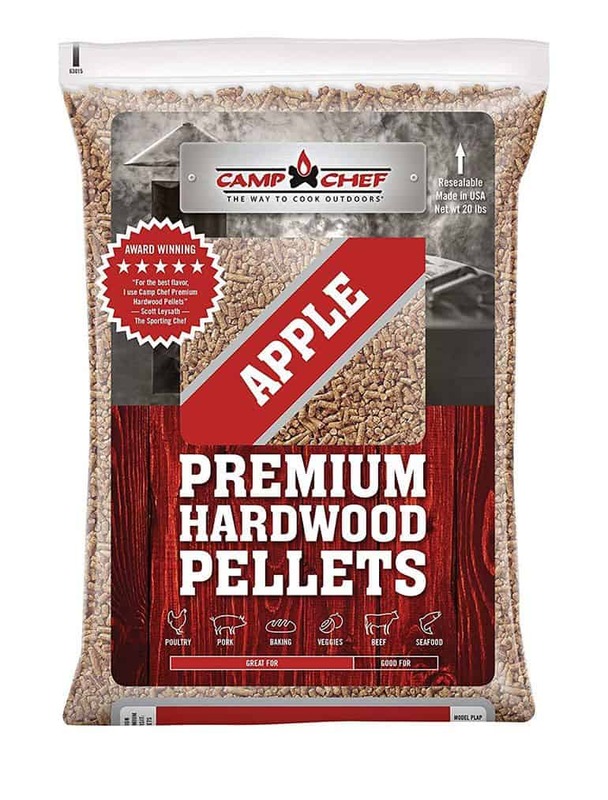 Camp Chef have been in the wood fuel game for a long time, and these smoker pellets are a perfect example why. They’re a beautiful blend of 100% natural pellets that will match perfectly with your pellet grill or smoker. In the mix is a blend of premium hardwoods, containing cherry, maple and hickory. These all combine beautifully to give a well-rounded yet subtle flavor that matches with almost any kind of barbecued meat. Some people prefer to mix their own hardwoods, but Camp Chef have done a brilliant job of perfectly blending these to produce a fine, natural choice of smoker pellets. One of the best signs of good wood pellets is that they leave very little in the way of ash or dust after use. These pellets from Camp Chef are no different, and their reputation as an excellent all-round product is more than warranted. This is another wood pellet blend, but this time with a blend of four different types of wood to give an even more well-rounded flavor. It contains maple, apple, cherry, and hickory. All of these match perfectly with a whole range of different meats. CookinPellets are seen as a premium brand, and these pellets don’t disappoint. They’re free of any kind of filler, so no oil, no dead wood, and no low-quality wood (like alder). It’s nothing but good quality wood fuel for your smoker. It’s called the perfect mix and, frankly, it’s hard to disagree. Another Camp Chef wood pellet, but this time it’s not a mix. Instead we have pure applewood grill pellets that match perfectly with any brand of grill. Made of solely applewood, this packs in a bit more flavor than any combination packet you could get, but if you want something with a smoky apple aroma then this is the one for you. It matches brilliantly with pork and poultry, but also smoked cheese. It can blended with alder wood to try and produce a more smoky and balanced aroma. It contains absolutely no fillers whatsoever, and is strictly high-quality apple hardwood. It leaves very little ash or dust, and its hardwood composition ensures that the smoke will be minimal and clean. With a name like ‘Pit Boss’ you’re going to be noticed. Sure enough, they’re a big name in the smoker world, largely owing to the fact that they make some of the world’s best grill wood pellets. 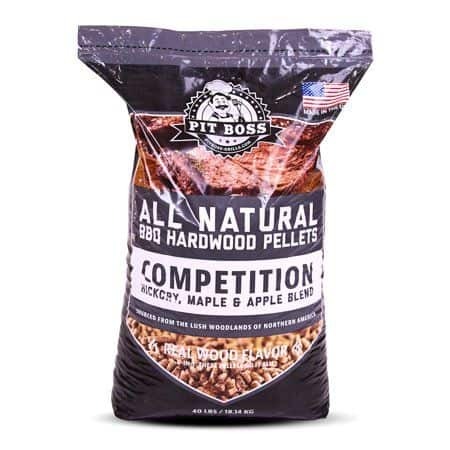 Their blend BBQ wood pellets come in two types: Hickory or apple. In terms of quality, there is absolutely no difference between the two, merely just what your personal preferences are for taste. Their wood is sourced from North America, and completely free from any fillers or chemicals. 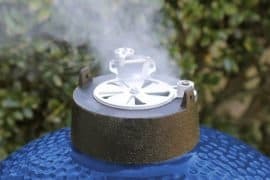 Not only does this help with aroma quality, and leftover ash, but it also means that they burn much hotter and cleaner than poor quality alternatives out there. Its competition blend is a mix of hickory, cherry, and maple hardwood, making for a great alternative should you not be sure what to opt for between hickory or apple. I recommend going for apple if cooking pork or beef, and hickory if cooking poultry. 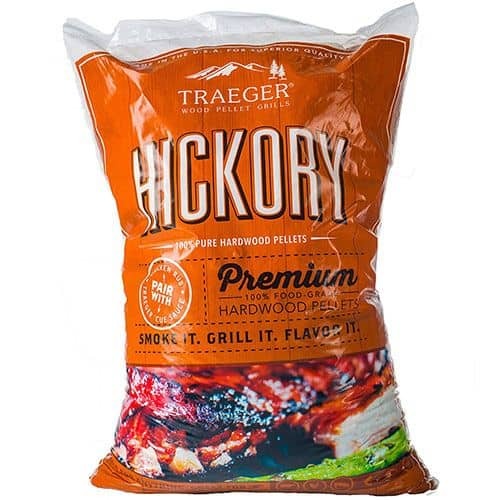 Traeger is the brand behind one of my favorite wood pellet grills (link here), and so it stands to reason that they’re also the brand behind one of my favorite BBQ wood pellets. These pellets are some of the cleanest out there, leaving minimal ash after use. Furthermore, they contain no fillers and are 100% hardwood, meaning they burn cleanly while still imparting a beautiful smoky flavor on your food. They’re pure hickory rather than a blend, bit still go well with beef, pork and game. When choosing your pellets, always go for something that’s 100% hardwood. This means that not only is it free from fillers and chemicals, but also that it will burn cleanly and have little negative impact on the environment. 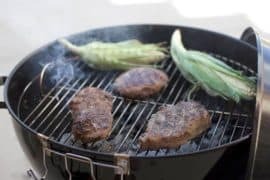 One of the most beautiful things about barbecue is the opportunity to use wood pellets or chips for infusing your chosen meat with extra flavor. Added to the smokiness can be woods like apple, maple, and hickory (among others! ), all of which can also be combined to take your meat to the next level. Wood pellets’ popularity is partly down to how quickly they light and warm up in comparison to charcoal. In fact, the time they reach optimal temperatures is pretty much on par with gas. This is amazing considering that is much more of an ‘organic’ fuel source. 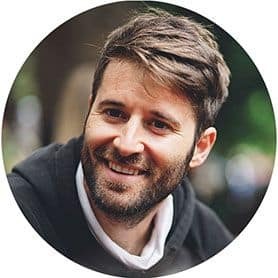 What are smoking wood pellets? What I love about wood pellets is the flavor that they impart on your grill. You simply don’t get that range of choice with gas or charcoal grills. These small pellets are made from recycled wood and sawdust, usually taken from the leftover wood found in wood mills. The wood is broken down into tiny pieces before being remoulded into small, dry pieces. Make sure you don’t buy heating pellets, confusing them for wood grilling pellets. These are designed for heating homes, and not for being thrown into your grill. What flavors are there for wood pellets? This is where you can really experiment. Finding the right flavor pellet for you is going to have to involve experimenting and trying different ones until you land on what you like. What types of wood pellet are there? In my opinion, the best type of wood. I’ve outlined the different flavors above, and this type of wood lends itself best to it. With a 100% composition, the flavors in the pellets really come to shine when cooking. The downside is that these types of pellets are a little more expensive. My counter argument though is that BBQ is all about the flavors and aromas, and flavored wood gives you the best experience. This is an ‘economy’ level of wood pellet that combines flavored wood with a filler agent to make it cheaper. Unfortunately, this ratio is more in favor of filler than it is wood. We’ve seen filler used in fuel like briquettes for charcoal grills or smokers, and sadly it’s not uncommon with wood pellets either. In the case of pellets, filler tends to be comprised of oak. This is because it burns very well, however it doesn’t really provide any flavor to the barbecue. I might seem very down on blended pellets, but I’m a purist at heart and would much prefer to use something pure. 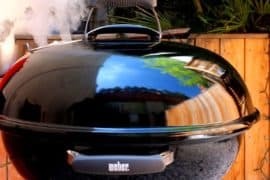 For you to enjoy a clean, authentic taste to your BBQ I’d recommend you do the same too. 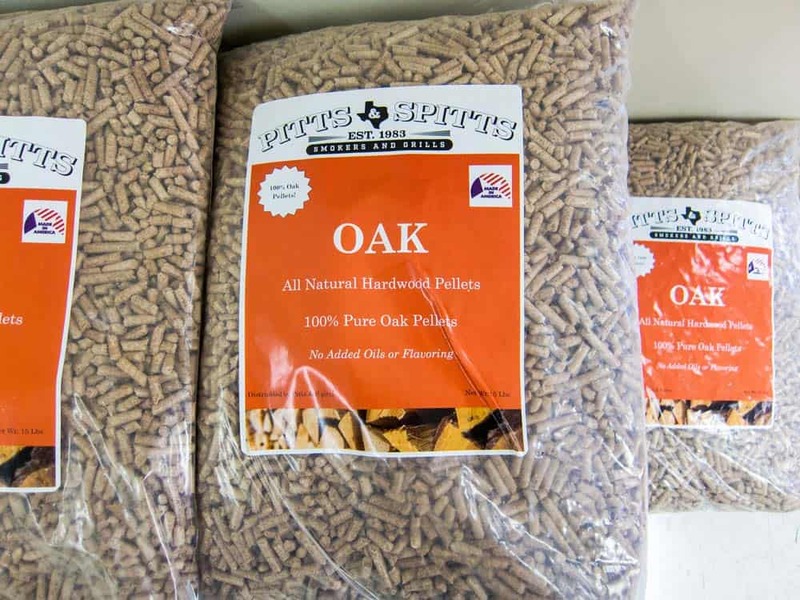 These pellets carry no flavor at all, and are generally made of oak. They burn well, but don’t impart any flavor on your food. As a result they’re best used for heating rather than cooking. Keep an eye out for dust. Cheap pellets tend to decompose and fall apart very easily, and a clear indicator of this is if a pile of dust has gathered at the bottom of the bag. When choosing your pellets, try to look into the bag and see how much dust is nestling in the bag. Avoid bark. While we do like to see bark gathered on our brisket, we don’t like it on our bark. This type of wood doesn’t burn in the same way as the wood in the pellets does, which can play havoc with the cooking temperature and heat consistency in your grill. They also create a lot of ash, which can make your grill a mess.